Many natural resource management and conservation services are now being delivered in an entirely different manner than they were just a decade ago. Since most of these changes and adaptations seemed to happen so incrementally, it went largely unnoticed. What we mean by a “New Conservation Model” is the shift away from agency-driven natural resource management and conservation/restoration efforts, to one that is highly reliant on public-private partnerships, volunteers and non-governmental organizations (NGO’s). This is not to suggest that State and Federal agencies historically charged with these responsibilities are no longer relevant, nor are we suggesting that the current paradigm is a bad thing. In fact, there is a little something here for everyone. Where else can you find those who favor small government and lower “taxes” (fees) working in partnership with those who are more likely to describe themselves as environmentalists than conservationists? For those who support further decentralization of resource management, there is that too. “Place based” decision-making by stakeholder groups and engaged individuals has been evident, especially within the watershed management communities. Examples of this shift abound. Nearly all watersheds of any significance have at least one group working on its behalf and many have grown to a point where they now have paid professional staffs. Many of these river and watershed groups now also perform their own habitat restoration, sedimentation and erosion control, as well as water quality monitoring. Most of these initiatives go well beyond that which the DNR and DEQ ever had the capacity to conduct on their own. 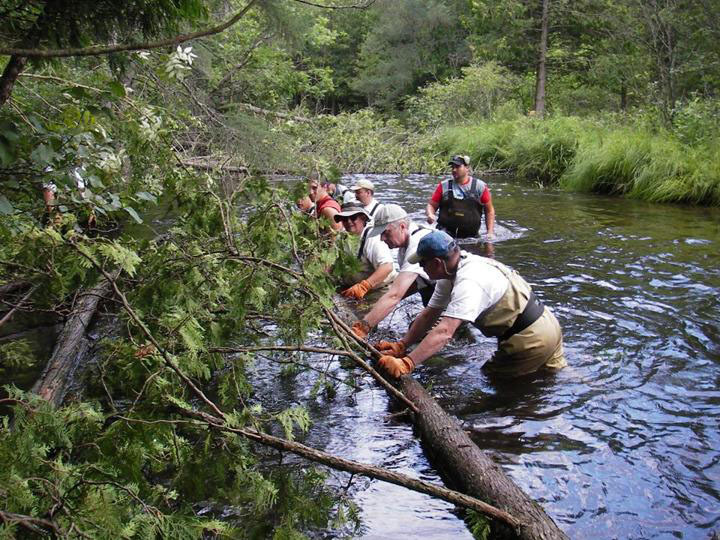 Many sportsmen’s clubs and local chapters of conservation organizations have also become increasingly engaged in wildlife habitat restoration and planting, in addition to those on the fisheries side of the ledger. Those include various Michigan chapters of Trout Unlimited as well as a myriad of species-specific groups who also help with such things as walleye rearing ponds, angler surveys, and field assistance. The pinnacle of the movement in the northern lower peninsula, however, are represented by Conservation Resource Alliance (CRA), serving the northwest lower peninsula, and its counterpart in the northeast, Huron Pines. Both of these now-independent NGO’s have their origins in the U.S.D.A. Natural Resource Conservation Service Resource Conservation and Development Program (RC&D). They conduct a wide range of conservation-related projects with professional staffs and are both national success stories for what remains of the original RC&D program. Support for this public-private partnership concept has now also been provided through the passage of the 2011 House Bill-4111. The goal of this legislation was to remove the legal and administrative encumbrances which had previously been identified by the Michigan Department of Natural Resources as limiting their ability to more aggressively engage volunteers. Without question, there is far more good which has resulted from this shift than bad. With the exception of the CRA’s and Huron Pines’ of the world, however, it remains to be seen how sustainable the roles of the volunteer and small NGO’s will be in the future. This area of potential concern relates to the somewhat fragile nature of some of these small organizations, some of which have not even been formally chartered as a legal entity. Many of these groups are entirely volunteer operated and are funded through small donations and grants. As these volunteers leave through age or “burn out,” will there be a sufficient number of new effective leaders to take their place? For this new model to work effectively and be sustainable, it remains our view that a certain level of professional technical assistance and institutional knowledge must remain with those agencies charged with the fulfillment of its mission. Although this may not need to be at staffing levels which existed when this new conservation model began to take shape, it does need to be at levels which are adequate to effectively help sustain the current level of private-public engagement. After the next round of DNR field staff reductions, together with those that loom on the horizon, it seems unlikely that sufficient resources of this type will exist. This alone will represent a significant obstacle to the growth, viability, and credibility of this new model. As just one example, the Northern Lake Huron Management Unit within DNR Fisheries Division will soon be reduced from three biologists to two. This management unit includes the Lake Huron watersheds of the eastern upper peninsula and all of that to the southerly limits of the Au Sable River watershed. Although this may be viewed as “only” one biologist, it represents a 33% staff reduction for the unit. For those partner groups who rely on at least some level of participation from the public agency charged with the oversight of these resources, one biologist for what amounts to approximately 5,000 square miles of land and water area is entirely unreasonable. If we’ve learned nothing else it is that in order for this new Conservation Model to continue to flourish, all of its partners need to be viable.